Home > Car Audio > Unloaded Sub Boxes > Single 10"
We stock Single 10" subwoofer boxes that will work perfectly with your car audio system. 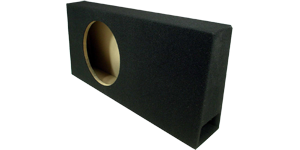 From sealed to vented (ported) we have subwoofer boxes that will work with your listening style. We recommend a 10" vented sub box if you like listening to rap, modern rock, or anything with long deep bass. We recommend a 10" sealed box for classic rock, techno, or anything with a fast beat. All of our boxes are constructed with high quality MDF wood and are built to last.